University of Karachi: B.Sc., 1960; Technical University, Berlin, West Germany: Metallurgical Engineering Courses, 1962-1963; Delﬅ Technological University, Delﬅ, Holland: M.Sc., 1967; University of Leuven, Belgium: Doctor of Engineering, 1972. 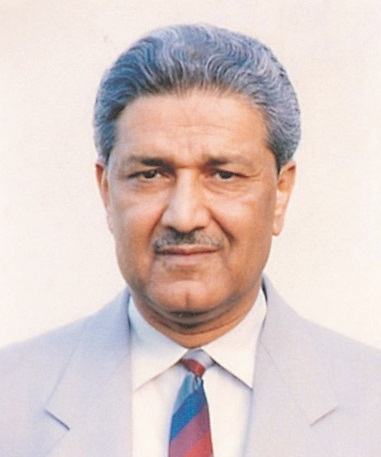 Special Advisor to the Prime Minister on Strategic Program, KRL Aﬀairs, 2001-2004; President, Pakistan Academy of Sciences, 1997-2002; Chairman, Dr. A. Q. Khan Research Labs, Kahuta, Pakistan, 1998-2001; Project Director, Dr. A. Q. Khan Research Labs, Kahuta, Pakistan, 1976-1998; Project Director, GIK Institute of Engineering Sciences & Technology, Topi, Pakistan, 1990-2002; Senior Metallurgist/Deputy Manager, FDO Eng. Consultants, Amsterdam, Holland, 1972-1975; Research Fellow, Leuven University, Belgium, 1968-1972; Research Assistant to Professor Burgers at Delﬅ Technological University, Holland, 1967-1968; Inspector of Weights & Measures, Govt. of Pakistan, 1959-1961; Practical Trainee with Siemens Pakistan Eng., 1958-1959; Tech. Asst., Star Eng. Works, Karachi, Pakistan, 1956-1958; Chief Coordinator for Guided Missile Programe,1990-2000. Nishan-i-Imtiaz and Bar, Govt. of Pakistan, 1996,1998; Hilal-i-Imtiaz, Govt. of Pakistan, 1989; D.Sc., University of Karachi, 1993; D.Sc., Baqai Medical University, Karachi, 1998; D.Sc., Hamdard University, Karachi, 1999; D.Sc., Gomal University, D.I. Khan, 1999; D.Sc., University of Engineering & Technology, Lahore, 2000; Sir Syed University, Karachi, 2001; Balochistan University, Quetta 2003; M.A. Jinnah University, Karachi, 2012; NED University of Engineering & Technology, 2014; 66 Gold Medals and 3 Gold Crowns from various National Organizations; Acclaimed as Moshin-e-Pakistan by the whole Nation; A Large number of Institutes, Auditoriums and Research Centers have been named aﬅer Dr. A. Q. Khan within Pakistan and abroad. Fellow: Islamic World Academy of Sciences, Kazakh National Academy of Sciences, Pakistan Institute of Metallurgical Engineers, Pakistan Institute of Engineers, Institute of Central and West Asian Studies; Chartered Engineer and Member, The institute of Materials, London; Member, American Society of Metals (ASM), The Metallurgical Society of the American Institute of Met. Min. and Petr. Engineers (TMS), Canadian Institute of Metals (CIM), Japan Institute of Metals (JIM). Metallurgy, Materials Science, Nuclear Technology with keen interest in Physical Metallurgy, especially Structure-Property Relationships in High Strength Alloys, Ballistic Missiles and Enrichment Technologies.